PPS Impact Magazine » Change Is in the Air! Michelle Collie is the chief executive officer (CEO) of Performance Physical Therapy—a Rhode Island private practice with nine locations. Michelle is proud to share that she is originally from New Zealand, where she graduated as a physiotherapist in 1994 from Otago University. Michelle has served on the National PR and Marketing committee since its inception and led the development of the “Lifestyle Project.” With 20 years of experience, 12 of these as a private practice owner, Michelle has had the opportunity to gain experience and knowledge in the management and leadership of private practice. Through strategic marketing and public relations efforts, Performance Physical Therapy has had significant growth in recent years. In 2014, Performance was awarded the Jane L. Snyder Practice of the Year, and Michelle was a Rhode Island Entrepreneurial Women to Watch awardee. Michelle is excited to lead the committee as it becomes even more of a resource for the private practice members. A tool you can use! The Lifestyle Project began as an idea to develop an interactive online questionnaire in which consumers would learn more about private practice physical therapy. 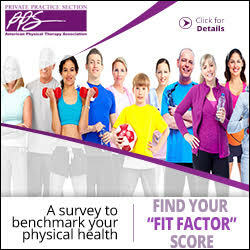 This resulted in “The Fit Factor: Benchmarking Your Physical Health,” a questionnaire that calculates consumers’ fit-factor score. This includes simple tests and asks questions related to balance, strength, posture, flexibility, ability to participate in everyday activities, leisure, sports, and pain. Embedded in each question are over 30 educational videos. This online tool will be a valuable resource for providing educational materials to patients, as well as increasing the public’s knowledge on what physical therapists in private practice do. Finally, links throughout will drive potential patients to the “find a physical therapist near you” resource. Learn more at Private Practice Section (PPS) annual conference, 2015! The Marketing and PR Committee is excited to provide members with tools and tips to improve their efforts in promoting their practices. Look for our members at annual conference—we welcome your feedback and ideas! Don Levine, PT, DPT, FAFS, is chair of the marketing and PR committee and co-owner of Olympic Physical Therapy with five locations in Rhode Island. He can be reached at dlevine@olympicpt-ri.com.